The Samsung Galaxy Note 2 is one very popular smartphone/tablet combo, and it was already known that over in China they would be gaining a dual SIM version of the Sammy phablet at some point. Now old Sammy has gone and officially announced the dual SIM version of the Android device for China, along with a date for when the Chinese Android faithful will be able to pick up the device. According to a report over on Intomobile, Samsung has officially announced the dual SIM version of the Galaxy Note 2, which will sport both GSM and CDMA SIM card slots, in the form of a regular SIM slot along with a microSIM slot. Of course aside from those two SIM slots, the Chinese version of the Samsung Galaxy Note 2 remains the same as other version, so the device will still come with that 5.5-inch 720p HD touch screen along with 2GB of RAM, an 8 megapixel rear camera and 2 megapixel front snapper, and powered by a 1.6GHz quad core processor. As for when the Android faithful over in China will be able to shell out their cash for the dual SIM Samsung Galaxy Note 2, the device will go on sale as of the 3rd of December, so they can have the handset in time for Christmas. Dual SIM devices have always been quite popular over in China, and no doubt this version of the Galaxy Note 2 will be just as popular. As for pricing of the dual SIM model, it will hit the pocket for 5,699 yuan, which is roughly $915 unsubsidised, so is a tad on the steep side. Still price aside there’s bound to be quite a few over in China eager to get their mitts on the Android combo. Ho ho ho … Merry Christmas ! 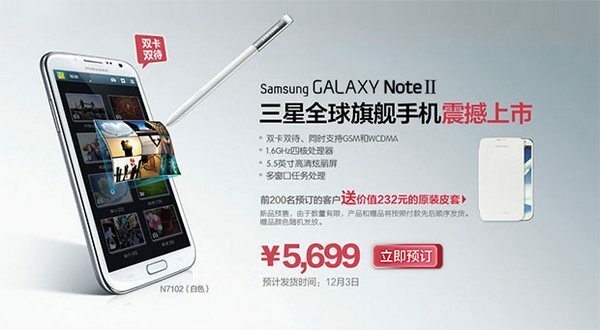 A Dual SIM Samsung Galaxy Note 2 in China … if ever I saw a stimulus for the Chinese 6 inch Smartphone makers … This will be it ! 6 inch dual SIM devices have been rolling out of China for months now … I know, I bought one and it is running perfectly here in the UK. I doubt this post will last on the board for very long … so enjoy it while you can. Just Google ‘China, 6 inch phones,’ and enjoy what you find. and … Have a great 2013 too. I forgot to mention that importing my ‘Chinese SGN 2 lookalike’ cost me Â£148 … including Customs Duty and VAT … and the ‘all I can eat Giffgaff SIM card costs me Â£12 / month. My ‘end of contract’. Orange SIMM is still alongside the Giffgaff and I used a PAC code to transfer my mobile number to the Giffgaff SIMM.